Seals are more important if your company or your industry has trust issues. Seals are more likely to positively impact smaller or lesser known brands. If you’re Amazon or Walmart, seals don’t matter as much. Certain seals work better than others. When we say certain seals work better, we don’t just mean building trust in your brand. Seals can also positively impact your SEO — since increased trust in your site can result in longer site visits and lower bounce rates. The right trust seal can also increase conversions. 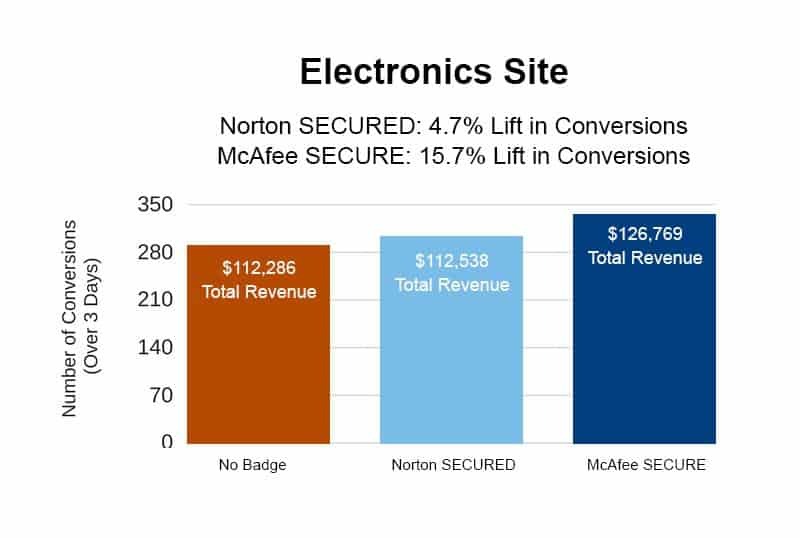 In this article, we’ll show you three tests we’ve conducted with Norton and McAfee seals that led to an increase in revenue, and we’ll conclude with recommendations for when and how to use different eCommerce trust seals on your site. What Are Trust Seals or Trust Badges? A trust badge is a badge, seal, or emblem that a company displays on their website to make the site feel trustworthy, illicit credibility, or a feeling of security from their visitors or customers, as it indicates the presence of identity protection. Typically, these badges are granted from security companies such as McAfee, Norton, TRUSTe or from business rating organizations such as Better Business Bureau. Logos from companies like PayPal or Verisign, or even simple SSL certificates may also loosely be considered trust badges since they can evoke trust from potential customers at the time of entering their credit card information. From a business standpoint, the website is calculating that the trust gained from the secure certification helps more visitors convert into buyers. We’ve researched numerous trust seals in our work (McAfee, Norton, BBB, etc.) via AB tests. Norton Security (powered by Symantec) and McAfee are trusted and well-recognized brands in the online security market. Similarly, BBB is the biggest brand in customer service ratings and has a huge trust factor. Other security brands, such as Authorize.net, Trust Guard and Trustwave, are cheaper (and sometimes even free with hosting), and they tend to be associated with less professional sites. This association, in turn, decreases the trust of other sites that use them. 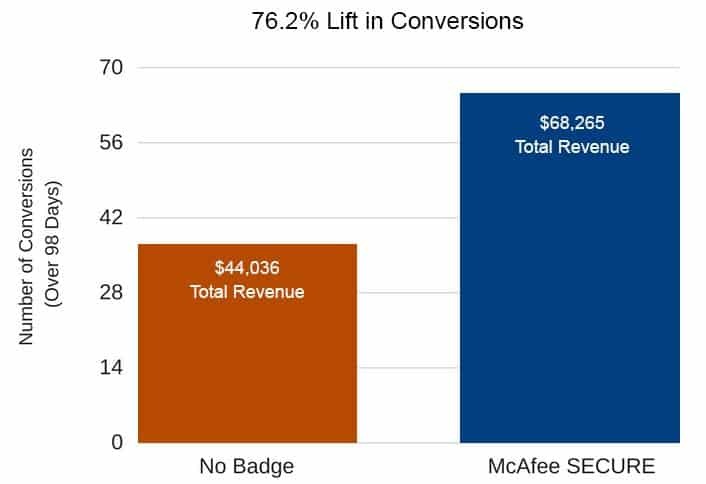 We’ve learned from our research that the McAfee trust badge—at the moment—is the most likely to increase conversions and the one we use most on client sites. As you’ll see from our recent tests, in all cases, conversions improved with the McAfee seal and decreased without it. Note: Still unsure which security and customer service badges are right for your site? Or looking for other ways to optimize your site for conversions? Contact us here. We evenly split over 78,000 visitors between three versions of an electronics eCommerce site. The three versions of the test were the same in every other way except the presence of no badge, a Norton security badge, or a McAfee security badge. 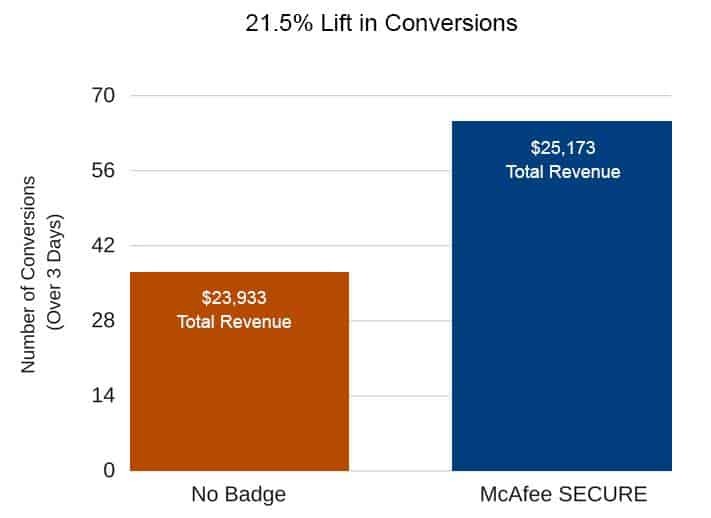 Showing the McAfee badge returned the highest lift rate of 15.7% with a 97% confidence score. Most sites that use a McAfee seal, including this client’s site, choose to use a floating badge, which sits on the bottom of the screen. On an eCommerce store specializing in a popular outdoor gear line, around 42,000 visitors were split between a site with no badge and one with a floating McAfee badge. The version of the site featuring a McAfee SECURE badge saw a 21.5% lift in conversions with a 95% confidence rate. 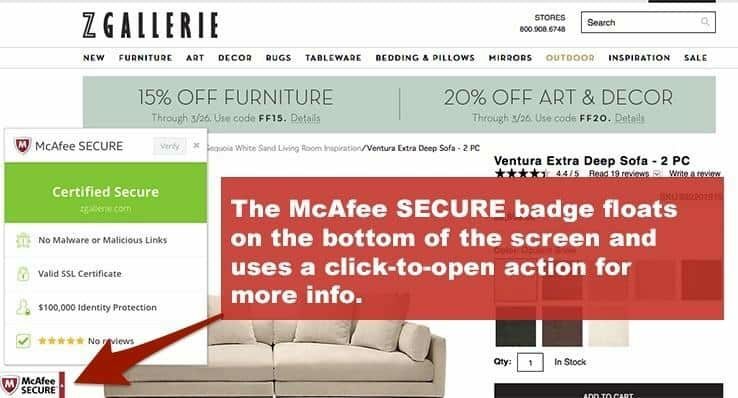 For this test, half of the site visitors, over 156,000, saw a McAfee badge in the header of the homepage and all product pages, as well as a floating McAfee badge on the bottom of the screen. This version resulted in a $24,229 increase in revenue compared to the control. This test has a 100% confidence score. Will You See These Results if You Add a Trust Badge like McAfee SECURE to Your Site? The tests detailed above are common in our experience, which is why adding a McAfee SECURE seal to our clients’ websites is often one of the first things we often test in our conversion optimization process. We suspect if you add a McAfee SECURE badge to your site, you’ll see a noticeable bump in conversions and revenue, because it almost always goes that way for our clients. With that said, nothing in CRO is universal, and every site is unique. Our advice is that every eCommerce site should at least try adding a secure trustmark like McAfee SECURE and see what happens. We always advocate for testing the results we report (or anyone else reports) for yourself so you can see if it works on your site, especially if you’re considering a trust badge or security seal not discussed in this article. You could even test specific badges related to your industry. The right placement makes a difference and should be tested. Raising questions about the security of someone’s money and identity while a customer is making a decision about a product may derail their willingness to buy online or simply at that moment from your site. Where raising security concerns on the cart/checkout pages on one site may cause online shoppers to react poorly or increase cart abandonment, on another site, it might help raise conversions. Consider testing a floating versus static seal, as well as testing the size of the seal — small changes can make a difference in your conversion rates. Note: We’re pros at finding small changes that reap big results. Let us help you maximize conversions on your eCommerce site. Contact us here. I split tested the Norton and McAfee trust seals on an e-commerce site in 2012. McAfee was their default trust seal, but it cost more than Norton. Was the McAfee seal worth the extra cost? The result: no statistically significant difference in ecommerce conversion rate. The client did not renew with McAfee and saved themselves money by switching to Norton. Seven years of experience later, I can’t rule out that placement and overall visibility played a role in the test result. The test should have included a “no trust seal” variation like your example. Thanks for that insight Mike. We test trust badges often and you always have to factor in the cost of the badge to get the true ROI. The badges cost different amounts for different websites which means the calculations are different for everyone. Results have varied client by client which is why we always test this. Factors like familiarity with the brand, look and feel of the site, and repeat purchaser rate all impact the amount of focus you need to put on trust badges as we mention in the post, so the only way to know what works for you is to try it out. We have definitely seen instances, as you mention, where the badges don’t drive ROI, but most tests have shown this being worthwhile.